Dr. Kleinerman never disappoints. She is one of the sweetest, caring doctors I have been to. She is further for menow but I will always make my way back to her. Dr. Kleinerman never disappoints. She is one of the sweetest, caring doctors I have been to. She is further for me now but I will always make my way back toher. Dr. Kleinerman is always professional, warm, and friendly. Her staff is the same and the offices are spotless. **Please note, this practice has a strict 24-hour cancellation policy. 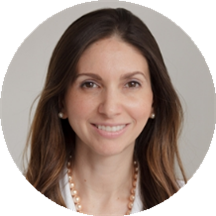 PATIENT ADDRESS IS REQUIRED TO BOOK, PLEASE INCLUDE IN THE 'NOTES FOR THE DOCTOR'S OFFICE' SECTION** Dr. Rebecca Kleinerman is a native New Yorker who is now opening her own dermatology practice on the Upper East Side of Manhattan. Dr. Kleinerman’s services include diagnosis and treatment of skin cancers, assessment and treatment of general dermatologic problems, and the use of the very latest laser and cosmetic procedures. Dr. Kleinerman is a graduate of Princeton University and New York University School of Medicine. She completed her residency in dermatology at the Mount Sinai Hospital in New York City, and an advanced fellowship in Mohs Micrographic Surgery and cosmetic dermatology at the University of California, Davis. Dr. Kleinerman is the author of more than a dozen scientific articles and her expertise has been cited in several health and beauty publications. If you have to visit a dermatologist I would heartily recommend Dr. Kleinerman. Dr. Kleinerman is great - Quick, attentive, friendly, and honest. Ditto on her staff. Absolutely great doctor! She was very knowledgeable and super buttoned up. Dr. Kleinerman is just fine, but every single time I’ve called her front office staff I’ve had an issue. They always forget about my request or do something incorrectly where I have to call back a couple times to get itcorrected. That inconvenience alone made me go to a different office because I would dread having to call and make a request. Having gone to a different dermatologist now, I can see there are also other doctors who are a lot more invested in correcting your skin issues with much more welcoming and accommodating staffs. Very clean office. The office staff and the doctor's assistant were very friendly. Dr. Rebecca Kleinerman was quick but thorough and answered all my questions. I would definitely recommend her! Best dermatologist I've ever had! Dr. Kleinerman is an excellent listener and a clear and direct communicator. The office staff is warm and efficient. Dr. Kleinerman was lovely, very pleasant and knowledgeable. She put me at ease and comfortable. I would recommend her to other people. In fact, I am going to send my sister to her. She's very knowledgeable, professional, and I would recommend her to everyone. I highly recommend Dr. Kleinerman. She is careful, conservative, and very knowledgeable. Her cosmetic work is excellent. I have gone to her for medical as well as cosmetic concerns. She is wonderful. Doctor was OK. Professional and friendly. My main issue is that she assured me skin tags are not covered by insurance, because they are harmless. But then still sent them for lab results, and and I had to pay extra. Myprevious dermatologist would either send them for a test, but them insurance covered the tag removal, or just changed me for the removal, but then would not send to the test. Does not seem right to do both. The amount was not too significant for me to argue, so I just let it go, but decided to switch the doctor. Dr. Kleinerman is great, super professional, nice and trustworthy. Will continue to come here! She was very professional, and made me feel comfortable. Would definitely recommend her! Highly recommend Dr. Kleinerman! Very efficient and really good bed side manners! I love seeing Dr Kleinermann - she is always kind, thorough and professional. I visited Dr. Kleinerman one year ago, and recently moved to California, which makes me realize how amazing Dr. Kleinerman is (I knew she was great, but didn't feel the push to write a review till now). Dr. Kleinerman is highlyprofessional, patient, informative and very thoughtful. I visited her for my acne and fungi infection, she not only gave me the prescription but also provided a thorough consultation about my daily skincare routine and products, all are pharmacy brands, not expensive but function great! I told the diagnosis and prescription from Dr. Kleinerman to my dermatologist in LA, he confirmed what Dr. Kleinerman suggested and prescribed was excellent. Still grateful of meeting such a great doctor. Thank you Dr. Kleinerman! Very kind, amenable, knowledgeable, and caring! Was in and out with al the help I needed in 30 minutes! Dr. Kleinerman and her whole staff were professionally, patient, friendly and thorough. Dr. Kleinerman and her staff were utmost professionals and very good at addressing my concerns and putting me at ease. She was very clear in her instructions and the overall visit was very pleasant despite needing to go in for an unpleasant reason. She's very kind and patient and fully explains everything she's doing. I feel comfortable in her care. Very positive and knowledgeable. I’ve been twice and I will continue to use her as my dermatologist. Dr. Kleinerman is an amazing doctor and extremely friendly and thoughtful. Always a joy visiting her office. Dr.Kleinerman was kind and professional during my annual skin check. She was efficient and listened to my concerns. Would highly recommend! Excellent treatment. Thorough, clear, reassuring that nothing was missed or overstated. Highly Professional service and office atmosphere. She’s great! Would highly recommend. I have been going to Dr. Kleinerman for years - she is the best!!! Her office is such a joy that you look forward to the visit. Dr. Kleinerman treated me with respect, kindness, professionalism, confidence and efficiency. She listened to and responded to all my questions. Her office is immaculately clean and the personnel are friendly and professional. It is a pleasureto have a visit with Dr. Kleinerman. She cured a problem no other dermatologist had been able to cure in over 10 years. She has my eternal gratitude. She had a great bedside manner and was very thorough. I felt comfortable and she seemed very knowledgeable. The office was small but very clean and orderly. The woman I checked in with was very nice and welcoming. I plan to continue seeing Dr. Kleinerman and would recommend her! Dr. Kleinerman is an excellent physician, highly competent. She instills confidence. She is also a very nice person!!! Kind gentle and efficient. Always on time and wonderful office environment and staff. Dr. Kleinerman is the best! Great bedside manner, obviously knowledgeable, professional and warm. IVe been seeing Dr Kleinerman for a long time. She’s a great Dr, very professional & I will strongky recommend. Dr. Kleinerman is extremely smart and has excellent bedside manner. She takes thorough notes and treats patients with compassion. Highly recommend! Her office is also state of the art - an added bonus! Very sweet and professional. Answered all my questions, took notes, and gave me some new things to try. Very pleasant, professional and easy to talk to. Would definitely recommend. Very knowledgeable and straight to the point. Clean, comfortable facility. Can’t recommend enough. Dr. Kleinerman was very professional and staff were professional except the front desk receptionist. Front desk reception She began checking me out as the incorrect patient, make sure to keep an eye out for the checkout process when dealing with reception. Very professional and genuinely concerned. The clinic was tiny but very clean. The secretary and the nurse were nice but I met nicer people. The doctor was very prepared and helpful. I really recommend her. She is very knowledgable - I came to visit her with several questions and she took the time to explain her answers, and wrote down recommendations for face lotions/cleansers for me. She's very kind, the office is clean, and I always feel as if my questions and problems are addressed. Dr. Kleinerman is not one for bedside comfort. She is very straight to the point. She gives you options and has you choose what you think is the best treatment for you. She was great, her staff was great, they were quick to see me, listen to what I had to say, recommended a few options and help me determine the best route to go, thanks! Her office was professional and inviting, and so was Dr. Kleinerman. She asked good questions, listened attentively, and clearly explained treatment and follow up care. Her assistants in the office and the exam room we're also all very cordial and professional.